This is a nutrient-dense, tasty, and colorful veggie side dish. My combination provides a variety of textures. In addition, cooked carrots and onions create a sweet flavor. 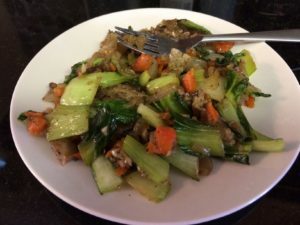 I mix in Kelp Granules with the veggies, which adds trace minerals – especially iodine. You could use almost any veggies you want. Be creative. The flavors obviously come from the vegetables you select, but the coconut aminos add a unique flavor that I find delicious.